The long-awaited day has finally arrived. After years of begging Air France/KLM to give it more money, Alitalia has finally shifted its glances in a different direction. The perennially-struggling airline has announced that Etihad will pour in a bunch of money and own just shy of half of Alitalia. You know that this means. By the rules of the transitive property of equality, Etihad is now the worst airline ever. Maybe this, uh, isn’t completely mathematically accurate. After all, Etihad will “only” be buying 49 percent of Alitalia, and that’s only if Alitalia meets several conditions, including job cuts. But Etihad is building up quite a track record of pouring money into financially-beleaguered carriers and preventing failures that would improve the health of the industry, so this “worst airline” title isn’t entirely unearned in its own right. We don’t know how much Etihad is paying, though it’s been quoted that the airline will be willing to spend over 1 billion euros for the privilege. That’s a lot of money to throw down a rabbit hole, but I guess it’s not a lot if you’re backed by the bottomless pit of wealth coming out of Abu Dhabi. I wrote last year how Etihad was effectively trying to cobble together its own fourth global alliance by buying up stakes in airlines and then tightening their commercial arrangements. That alone isn’t a big deal, but the problem is, as mentioned, that Etihad is simply propping up failing airlines. Many of Etihad’s partners aren’t commercially viable and without a lifeline, they would have drowned. Just look through the portfolio to see what I mean. Alitalia, the long time holder of the title of world airline ever, is just the latest example of this. Air Berlin has been on the ropes, hemorrhaging cash. Etihad helped that airline survive when it first invested, but Etihad recently had to put more into the kitty. And Etihad Regional (formerly Darwin Airline, of which Etihad now owns 33 percent) is meant to feed these European money-losers. How about Jet Airways of India? It hasn’t made much money in years, and just posted record losses. Etihad is a recent investor there, but it’s already being discussed how much more the airline will have to pour in. Virgin Australia is also losing money like crazy, and it probably has too much capacity in the market. Though if Virgin Australia cleans up its act, it should at least have a long term place in the industry. At least Aer Lingus is making a little money. But then again, Etihad only owns a very tiny piece of that airline. Oh, and let’s not forget Air Serbia. It’s hoping for a breakeven year, which would be an excellent result for an Etihad partner. But Air Serbia also pays Etihad to manage the airline, so even if Air Serbia only breaks even, Etihad still makes money. Good for Etihad, bad for the industry. Lastly, there’s Air Seychelles. This airline has actually posted a profit for two years in a row. That may sound impressive, but it’s hard to know exactly how that number is being calculated. After all, its long haul “fleet” is two A330s wet-leased in from Etihad. I have to wonder if they’re paying market rates… anyone want to make a bet on that? This was an airline that had abandoned long haul flying completely before Etihad stepped in to revive it. The result of Etihad’s work so far is that there are airlines that should either be smaller or shouldn’t exist at all. These carriers are limping along, but with the deep (and I mean DEEP) pockets of Etihad, they don’t have to worry about actually going out of business. Etihad might find this arrangement works well, but I’m sure that most other carriers in the industry who have to compete with these money-losing airlines are steaming. Does that make Etihad the worst airline ever? Nah, Alitalia will still hold that title, especially if it can’t meet the conditions to actually get this funding from Etihad pushed through. But Etihad seems to be trying pretty hard. So Etihad is the modern Swissair, with the same ‘buying a minority stake to assemble / beef up a separate alliance’, but they have learned from that prior experiment and now have much deeper pockets to buy, operate and presumably restructure loss-making airlines rather than getting dragged down and bankrupted themselves? Let’s see if this remake ends differently than the original movie. PS. Did Etihad have the same global consultancy advise them on their strategy as Swissair did? AS – Well, that was McKinsey that tanked Swissair (among others), but I have no idea if they’re on the property at Etihad. 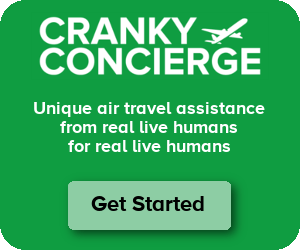 I was waiting for this blog when I first heard about Etihad buying a large chunk of Cranky’s favorite ‘Worst Airline in the World’ carrier. Only time will tell if what AZ must do now for this to happen will be a good thing or a bad move by Etihad. It is odd. Even taking a “long view” I am not sure I understand why investing in failing carriers is a good strategy. Sure they have customers and equipment and stuff, but filling someone elses hole seems harder than just building from scratch. And with a profitable core business that can grow organically, what is the true benefit here? The only thing I can think of is that there is so much oil cash backing them, that these investments are “free” and therefore a good way to try and win a war of market share and hope for profitability later…. Noah – What profitable core business? I haven’t seen anything suggesting Etihad has a profitable network. (Emirates, yes, but you’ll notice Etihad really just focuses on revenue growth.) I think they have specific motives here to build up their place in the world. It’s motivated by running a good business as a standalone airline. I would point to this press release, but I agree that there is very little transparency: http://www.reuters.com/article/2014/03/03/us-etihad-results-idUSBREA220OL20140303. I guess, my question is, if they are not re-branding other carriers, what benefit is there other than growing connecting traffic? Wouldn’t it be cheaper to grow traffic with their own metal? Presumably this strategy avoids much of Europe’s protectionist air policies, but it is an expensive way to please governments. Noah – Sure, they can make it look profitable. But that’s easy when you take $3 billion in a loan with no interest that doesn’t need to be repaid until 2027. Also, note that 21% of the airline’s revenues come from partnerships. I don’t know what that means, but how much of the partner costs hits Etihad’s books? I’m guessing they somehow don’t. The EY equity alliance is a bit odd. I was hoping they’d move more quickly on partnerships with AF/KL, Garuda and 9W. Maybe the work is behind the scenes like fuel purchasing. They’re doing some changes – for example lots of aircraft from 9W are doing EY’s routes such as AUH-JFK. 9W even started BOM-CDG in partnership with AF. But what does Alitalia give EY? A few more frequencies to AUH? I don’t see the strategic benefit, particularly since EY already control Air Berlin for Europe feed. It’s ironic that this blog appears on the day a good friend returned from India, via AUH on EY, waxing lyrically about the wonderful service – and that they held for his connection in AUH! Despite comments to the contrary from some pilots, some flight attendants, and most U.S. airlines denouncing the pre-clearance arrangements in AUH, they really do an excellent job taking care of their customers. While I wouldn’t expect those levels of service to appear on AZ anytime soon – we can always live in hope! Thanks Brett – nice blog! Y’all have to understand the politics here. Abu Dhabi and Dubai are semi independent sheikdoms within the same country. The sheik in Abu Dhabi sees the international powerhouse that Emirates has become, and he also sees how Qatar is growing. So he asks his advisers…where is my global airline? See how this works? Can’t let Dubai look richer or more important. Money is literally no object here. Buy him a global network. Doesn’t matter if we waste a boatload of money…we will just pump more of it out of the ground. Isn’t this also a pretty good explanation of the gradual dissolution of Gulf Air’s original quadripartite (Bahrain-Abu Dhabi-Qatar-Oman) structure? Brett, literally every post you make about Alitalia instantly makes my day better (I’m a travel agent, and Alitalia is my nemesis). But please don’t let Etihad pull Alitalia too far out of the Skyteam orbit, Delta’s the most reliable way to fix their issues! That really should just tell you how badly they fail… There’s a reason I fly American for my domestic travel when possible. On my last visit to the USA, when I went to check in for a domestic flight at CAK, after waiting in line at the check-in counter for 15+ minutes, I was told that my flight had been re-scheduled to depart 20 minutes earlier than what my printed itinerary said, and that I was now 2 minutes too late to be allowed to check in, and I would be refused for that flight. Aghast, I then looked up at the departures board, and saw that this same flight was now DELAYED by some 35 minutes, which meant that there should be more than plenty of time for me to still check in. When I then told this to the check-in lady, and then to her supervisor, they told me that they knew it was now about 50 minutes before the ACTUAL departure would take place, but that they had “closed” the flight before they were aware that there would be a 35 minute delay, and that by company policy that once they had “closed” a flight, they could not re-open it no matter how long it subsequently got delayed! Worst Airline? I thought you had given the crown to Air India (CF Aug 2011). When did it revert to Alitalia / EY? a.t. – Oh I’ve flirted with others. Air India definitely deserves a share of the title. And Aerolineas Argentinas took a turn as well. But ultimately, I just can’t keep it away from Alitalia for long. I think the Air Seychelles tie-up has only been done to one-up Emirates. I flew Emirates to The Seychelles for my honeymoon and at the time there was only a once-a-day on an old A330 from Dubai. Then they increased to two, and then back down to one. The Seychelles is absolutely breathtaking but it doesn’t need or require a high frequency large aircraft schedule to anywhere. In fact, I hope it never gets it either to protect its unique beauty. Eithad is the worst airlines i traveled so far. I booked the ticket and my seat was allocated. When i reached for the connecting flight i was shocked on their response i have given different route and my wait time was 9hrs. I was totally pissed off. Should United Close Its Hub at Washington’s Dulles Airport?